Can anyone recommend a Bangkaew breeder in or near Bangkok? I am interested in buying a Bangkaew puppy within a month or two. Thanks for any help you can give me! Are you in Bangkok now? Or traveling there soon? 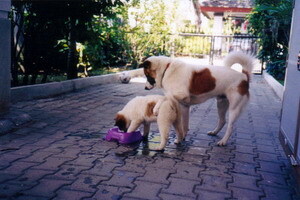 ..According your question, and if you don't mind, I would like to invite you to visit at a kennel where's near Bangkok. Ban-Chokhun is a bangkaew kennel that's in Ayutthaya province as far from Bangkok around 70 kms. (hoping it's not too far). Ban-Chokhun is a kennel that's been accepted and choosed from the "Kennel Club of Thailand" to be the kennel for showing to the committee form the A.K.U. (Asian Kennel Union). Let's a little bit introducing, I'm a breeder who's interest and serious with breeding for the best of the structure, temperament, movement etc. to get a value for the dog shows's activity under the regarding purpose of Ban-Chokhun is to keep the indentity and to proceed the breed development of "Thai Bangkaew Dog". Then, let's see some pictures that would be showed. These puppies were born on 8th April, 06. Let's see more pictures as the last year's result by Ban-Chokhun's bangkeaw dogs. His name is "Lom-Nuer" (means the win from the north). He was completely on the age of 9 months and 24 days to be the youngest new champian of Thai Bangkaew's Breed as his registeration of "Th.Ch.Lom-Nuer". My name is Payu, I’m a male Bangkaew dog. My owner visited Ban-Chokhun a couple of times to consult Mr. Tananan (the owner of Ban-Chokhun) in person about problems related to my behavior. My owner finds that Ban-Chokhun’s dogs are well behaved (unlike myself and another female Bangkaew dog she raises. We both are not from Ban-Chokhun). My owner would like to invite you to visit Ban-Chokhun, and highly recommend puppies from there. Bangkaew.Network is part of Bangkaew.Community to enhance its mission to promote Thai Bangkaew Dog into the international arena by introducing high quality Thai Bangkaew Dog from high responsibility kennels. Part of the revenue will be donated to Thai Bangkaew Dog Lover Club for the better life of Thai Bangkaew Dog. Thank you for your giving creaditable recommend to Ban-Chokhun, I just would like to introduce and glad to invite any foreigners to visit even they might not buy from my kennel. At least, Thai Bangkaew dog will be well known under the taking good care of Ban-Chokhun. However, many thanks for your admiring and thank you in advance for anyone who would be our guests.. I'm hoping to go back to Thailand at the end of 2007 and purchase some exceptional adult males to add to my kennel in the States.